* Be sure to like my Facebook page. I'll be posting a small giveaway on there later! 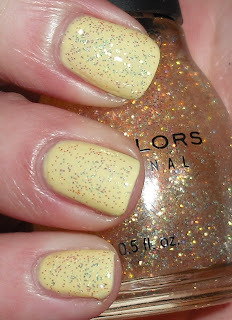 I have a pretty Sinful Colors glitter to show you today. I'm not much for layering glitters anymore, but this one is unique and well worth it. I'm not sure why it's called "Suede Shoes". Then again, Sinful Color names have always stumped me (i.e. Forget Now, Serena & Chloe,and What's Your Name). Their names never make sense to me. Suede Shoes is a golden iridescent glitter in a clear base. I love all the colors this glitter flashes. It flashes gold,pink,blue,and purple. I'm sure there is more. This is gorgeous. I do not have any other glitters quite like this one. I think this would look great over many colors. This one you can only find on Cherry Culture. They are currently having a 20% off sale until November 27th. This combo is really pretty on you. I too have no idea how Sinful Colors comes up with their names...maybe they have a group of kids in a think tank? LOL! This is gorgeous!!! Yeah Sinful has some odd names...like Pearl Harbor. Yeah, not exactly a happy thing that nail polish should be named after! Anyways, I love this manicure. I haven't seen this Sinful at my stores, is this an older one? This color is gorgeous, I've never seen it before! Yes, I think you can only find it on Cherry Culture. This is so pretty! Hope you had a nice holiday! I'm glad I'm not the only one that notices the weird names. I can remember all the names of the colors in my collection (most of the time they make sense) but never the Sinful Colors because they're just so random!